Well here we are again to chat about my Disney ink! It really is true what they say about having tattoos; you can never stop at just the one! 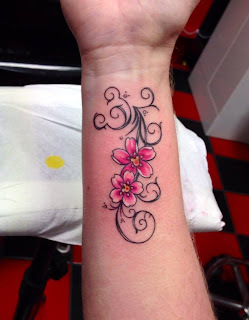 I had never thought I would be the one to be adorned in ink, in fact growing up tattoos were one of those taboo subjects and always associated with 'certain types of people'! Well here we are and I have fell in love with having tattoos! 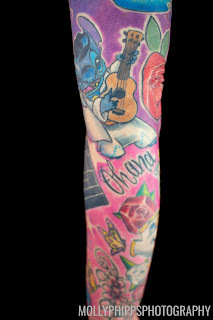 I remember watching 'Miami Ink' on TV a fair number of years ago now and gathering a whole new perspective on tattoos; it was hearing the stories behind the tattoos, watching the artists at work and realising that people of all types and backgrounds could celebrate the art-form together that got me intrigued. 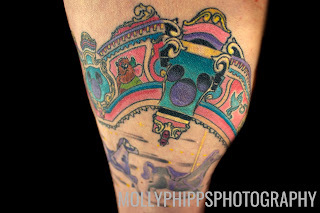 Once I'd made my mind up to have a tattoo I had two conditions; first it had to be something designed by my husband, Simon, so I could have a piece of his artwork on my body and second it had to have a Disney element to it. 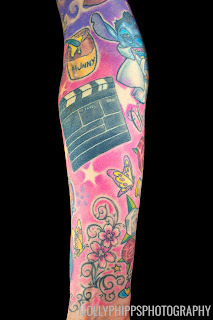 I'd also decided that my first tattoo would be somewhere 'hidden'...I don't think at that point in time I was overly comfortable with the idea of showing off the fact that I had a tattoo...Oh how times have changed! So my first tattoo was on my lower back; designed by Simon and tattooed by Gray Silva at Rampant Ink, Nottingham. It comprised of a Mickey head silhouette at it's centre before spreading out in a graffiti style. Simon even managed to incorporate his and the children's initials into the design. Next I decided that my foot and ankle would make an ideal spot for a bit more ink...not one to shy away from choosing areas of the body that can be challenging to get inked. Rachael Huntington was my tattooist of choice and was very patient with me as every now and then I would twitch involuntary as the needle moved around my ankle bone area! I thought I'd choose somewhere a little less challenging for my next tattoo and went for this Mickey design across the back of my neck. 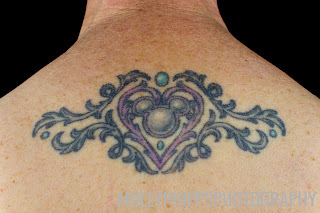 This was taken from an initial design by Simon that Rachael then embellished. The next one I had was also taken from some of Simon's artwork. Simon had undertaken a project called '365 Mickey's' where he drew a Mickey a day for a year. One of these drawings was a take on my ankle tattoo, so Rachael took the design from his artwork and came up with this tattoo for my inner wrist. 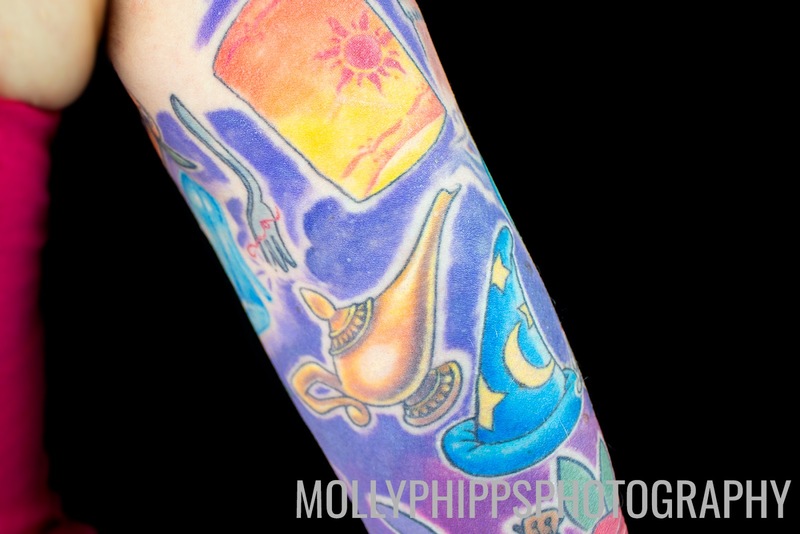 These photos taken by my talented daughter (Molly Phipps Photography) show my fully completed arm, this was completed over a number of months and mainly 6 hour sittings with an odd 3 hour thrown in! Then we decided to move over onto the other arm, for a Star Wars inspired tattoo - see my previous Disney Sleeve blog post which details the reasons behind this one! And that brings us up to now...and my latest tattoo. Now this has been a work in progress that lasted about 4 months and was completed back in October of last year. The inspiration this time came about while watching a burlesque show. 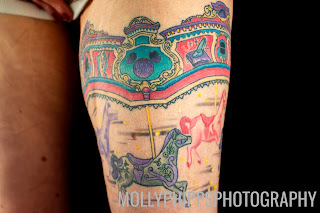 One of the performers, the amazing Chi Chi Revolver, had a tattoo of a carousel around her thigh and I fell in love with it. As everyone who loves Disney knows it was watching the merry-go-round at Griffith Park in Los Angeles that is credited with inspiring Walt Disney to develop Disneyland. This gave me that connection to Disney that all my tattoos have. 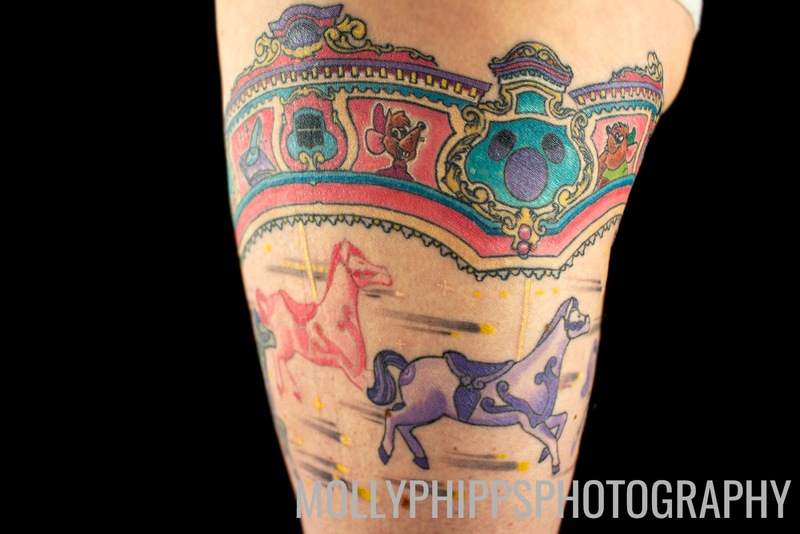 A carousel, around my thigh, inspired by the carousel at the Magic Kingdom at Walt Disney World, with horses like those seen in Mary Poppins! An idea was born! The carousel at the Magic Kingdom, once known as Cinderellas Golden Carrousel but now named Prince Charming Regal Carrousel, was themed...obviously...after the film Cinderella. 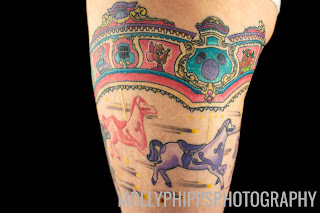 So with that in mind, plus Mary Poppins horses, plus Disney and plus a garter style tattoo I once again paid Saint Heywood a visit and after about 20 hours or more of tattooing my newest tattoo was complete. The whole tattoo was completed over a number of sittings most of which were 6 hours with a couple of 3 hours thrown in for good measure and I absolutely love it! 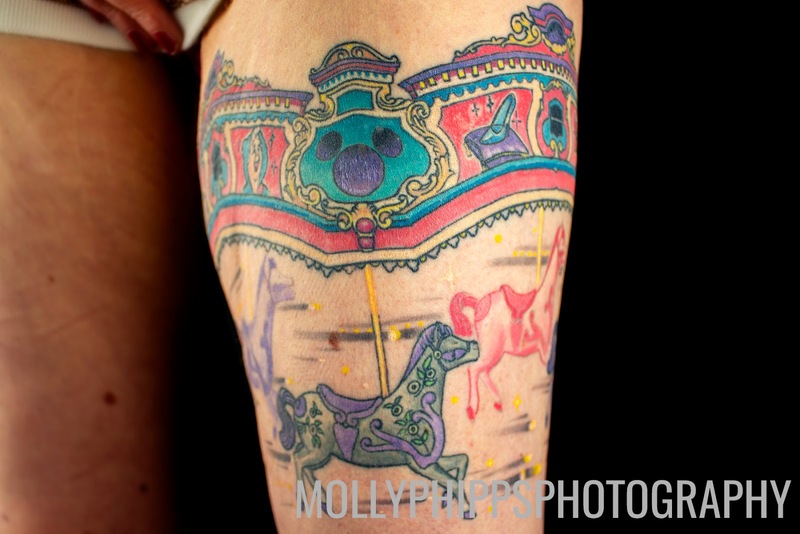 A big thank you to Molly once again as it proved a little tricky to get photos of this one!! Over the last couple of years I have taken a step into the world of cosplay, more specifically the world of Star Wars cosplay! This all came about when we were deciding what to do to celebrate Simon's 'birthday of a significant number' a few years ago. It was July/August 2015 a year before said birthday and the conversation turned to what Simon would like to do to mark the occasion and I mentioned that there was this 'Star Wars Celebration thing' in London that might be worth a look. And the rest as they say is history...check out these previous posts to see what we got up to! Since Celebration in 2016 we have joined two more costuming groups; Joker Squad and East Midlands Garrison. We have been able to troop at Legoland in Windsor in both 2017 and 2018 as part of their annual Star Wars Weekend to help raise money for a children's hospice along with lots of other conventions and events. We even turned up in costume at the pre-school I manage just before we finished for this years Summer break! We have continued to troop as Mandalorians and Simon has been keen to keep our kits functional and upgraded. He has made special 3D printed parts to house Go-Pro cameras, updated parts as they've shown wear and tear, upgraded belt pouches and even as I type he has been upgrading the holsters for my guns!! Simon's skill-set over the last couple of years has grown and grown; everything from 3D printing to moulding and cold casting aluminium helmets to just recently mastering leather-work. And he is loving every minute of it; he just loves the challenge of figuring something out and taking it from an idea in his head to a fully fledged and working piece of costuming. Any chance he gets to 'make something' he jumps at and nothing seems to phase him. As we have trooped with new costuming groups whose ranks include a multitude of Star Wars characters I began to think about the possibility of taking on another costume and this time one where I didn't have to wear a helmet. As much as I love my Mandalorian costume I do miss the ability to interact with people face to face. So between Simon and I we began to muse about what to do. 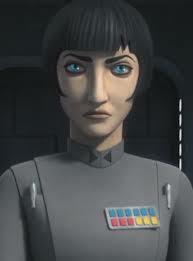 As it was Simon and I are both great fans of the animated series 'Star Wars Rebels' and in the series there is an Imperial Officer called Governor Arihnda Pryce. This looked the perfect character for me to have a go at; I could be a specific character that no-one in our costuming groups was currently doing and one that would be recognised by devoted Star Wars fans. So where to start? Now the great thing about the Star Wars world of costuming is that there are numerous groups out there offering advice and detailed information. 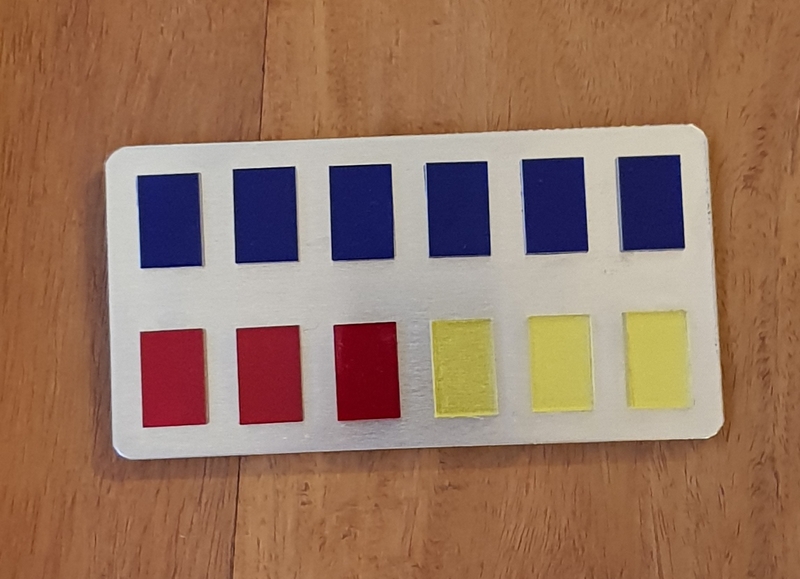 One such place is the 501st Garrison who have a data bank of costumes containing detailed information about colours, styles, accessories in fact everything to do with a specific character. By following their data bank guidelines I knew that the costume we created would not only be correct but would 'pass' any costuming group requirements. The ethos of all costuming groups is to ensure that the costumes representing them are made to the highest quality and are as screen accurate as possible. The 501st data bank has a great set of instructions for lots of characters, Governor Pryce included, so we decided to use those as our guide. The first thing was to source the uniform. Now neither Simon or I are seamstresses, we both dabble with material and the sewing machine but do not have the skills to construct a two-piece uniform from scratch. So off to the internet we went! 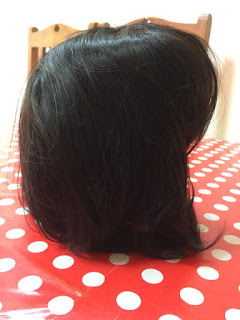 We used a site called cosplaysky.co.uk who stock a multitude of movie costumes that are of a high quality but that can also be made to measure. So we found the correct Imperial Officer uniform, input my measurements and waited. A couple of weeks later and my uniform arrived, then we could start the serious business of making it resemble Governor Pryce. 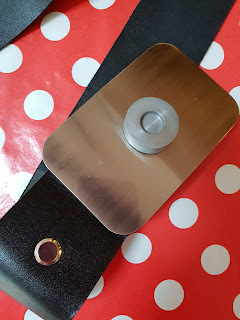 First thing we tackled was the belt; we found one online and dutifully ordered it but when it arrived we realised that the buckle was not quite correct. The standard Imperial Officer belt is not the same as the one that Governor Pryce wears. In steps Simon with his 3D printing and crafting skills. He was able to produce the correct detail, attach to the buckle and then adjust the belt to match the characters. 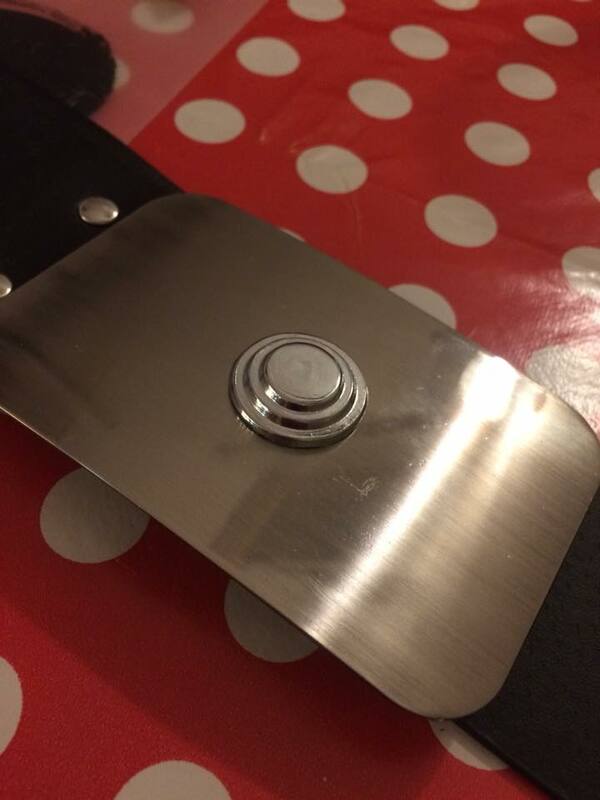 Simon was able to 3D print the centre code disk and from that he then made a cold cast aluminium version. This was then cleaned and polished and attached to the buckle which was in turn re-affixed to the belt so that a single rivet was visible to the left of the buckle. 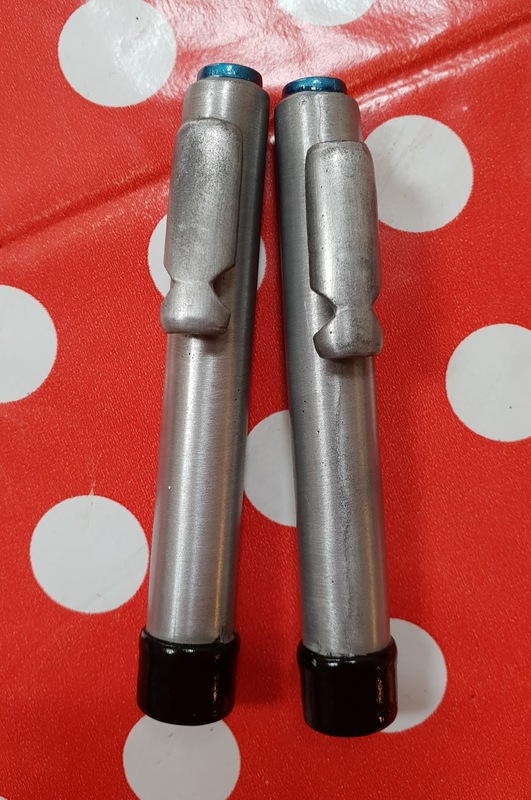 Simon also used his 3D printing skills when it came to the 'code cylinders' that sit in the pockets of the jacket. 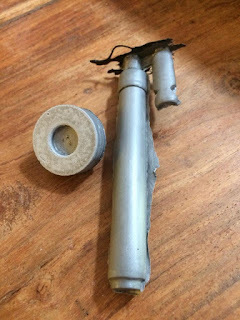 Once the 3D model had been printed Simon was again able to cold cast in aluminium the two that I needed. The next piece of the uniform required a little sewing. 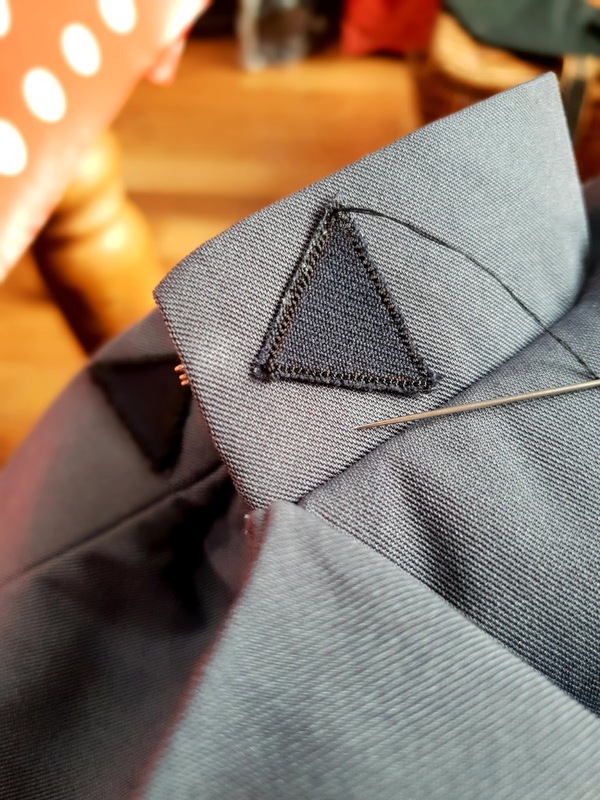 This was for the collar insignia; cut from some black fabric Simon was then able to create a seam around the edge using the sewing machine which gave them a 'sew-on badge' effect. I was then able to sew them onto the collar by hand (with a little help from 'wonder-web' to keep them in place). 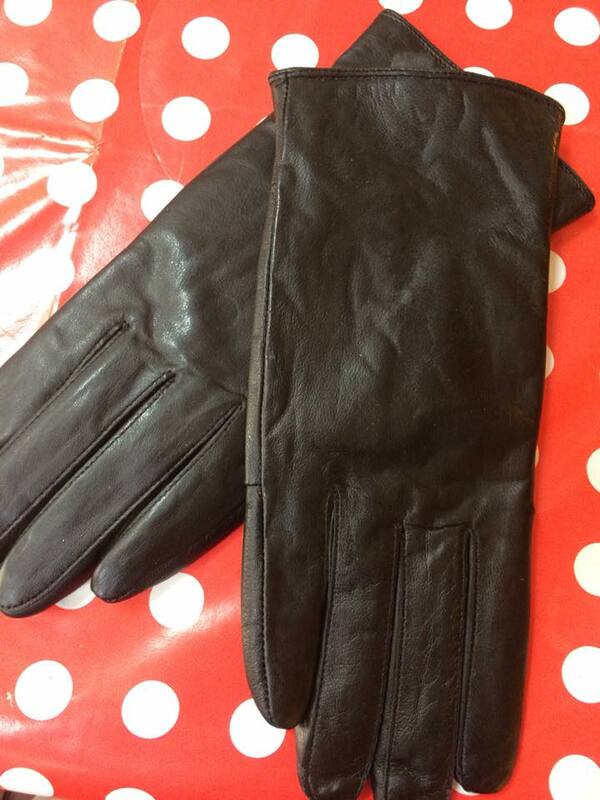 That just left gloves, boots, hair and make-up to sort. Gloves and the wig were an easy on-line purchase. Boots were a little more tricky as the first pair we tried were not as we hoped and had a seam running up the front which we didn't want. 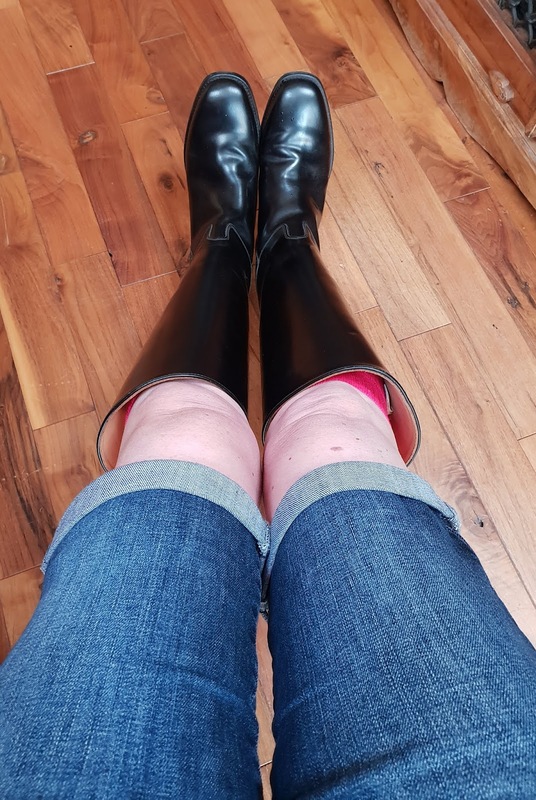 So back to the internet and we purchased a pair of riding boots which look so much better, although they do require a bit of wearing in!! Wearing them around the house!! 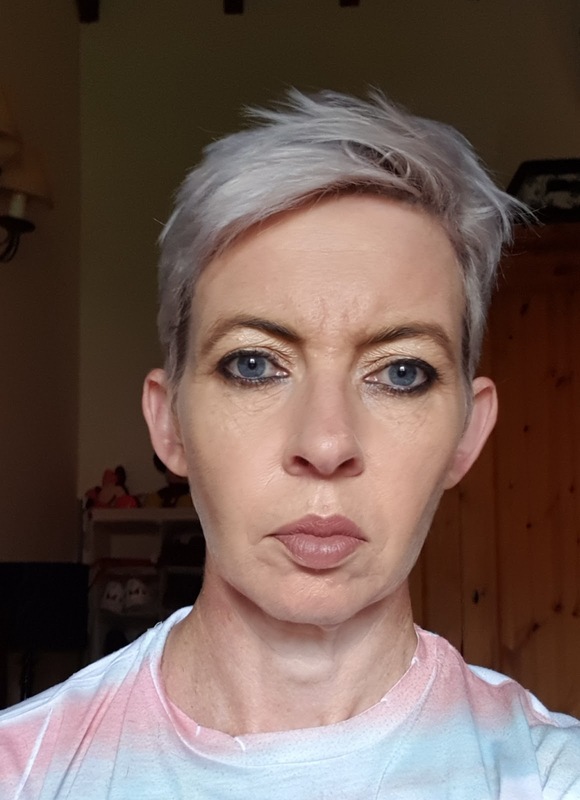 So then it was a case of enlisting help from my good friend Jo who was able to cut the wig to match the character and then it was left to me to have a play around with the make-up! ...right best get out there and do some trooping! What's wrong with real food? 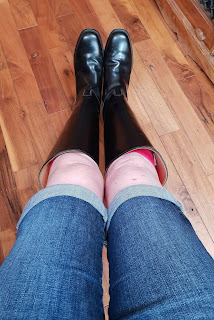 Well I haven't wrote a post for a while and to be honest time has been an issue and that's a poor excuse...I really need to start 'making' the time to write. So here we go as something today sparked in me the desire to write...well OK perhaps more of a moan...but well here goes! Scrolling through Facebook while waiting for my nails to dry...as you do...and I see one of those sponsored posts by a UK supermarket chain promoting one of their food products. The product in question is a Blueberry Muffin Fibre Bar - I mean what the heck is that supposed to be! Now on the Facebook post people were raving about this and celebrating the fact that there was even a chocolate brownie flavour. So my intrigue was sparked...knowing full well that this was likely to be more processed food rubbish. I really don't know where to start. Just reading this list is making my stomach turn, how can eating all of that in one bar be good for you? Just look how many different vegetable oils are in there, how much wheat product and never mind the sugars and all the ingredients I can't pronounce. Anyone that has read my blog will know that I now follow a Keto/Low Carb High Fat lifestyle but in my past I would have jumped at something like this. On the face of it, and how it's presented to the world at large, it looks and sounds healthy and the majority will think its 'probably better than having a cookie or a chocolate bar'. But with what I know now I don't even entertain the idea of eating anything like this, in fact I feel quite offended that products like this exist, in fact I'm quite angry that the food industry is still duping innocent people into eating stuff like this on the pretence that it is healthy and good for you. These bars are full of carbs and sugars that you don't need, they are full of wheat products that you don't need, they are full of vegetable oils that you really don't need. In fact there is nothing in these that you do need. A 24g bar is not going to satisfy any hunger pangs, you will be left feeling hungry very shortly afterwards and either resort to eating another bar or heading for the sort of foods you were probably trying to avoid by eating this in the first place. They are packaged and promoted as being the 'answer' you've been looking for. They fall in line with the 'low fat' model that has been pushed at us all for way too long now. They are made to sound 'healthy' and 'good for you'. The marketing line from the chocolate brownie version reads as this 'Enjoy these bars of chocolatey indulgence when you fancy something a little sweet in your day. High in fibre & less than 90 calories per bar? Delicious!' - UNBELIEVABLE. They are providing the 'easy' way out to a population that has been poorly informed over the last few decades. When will the message get through that we have all been fed a lie and that is why we are all struggling with our weight and most importantly our health. These should come with a 'health warning'! If you eat a diet that is full of protein and natural fats then there is no need for items like this. You will get the energy you require from real foods that will keep you fuelled throughout the day. Sure we all feel like a snack now and then or perhaps even a treat but there are better ways of doing it. Most people following a keto or low carb diet are able to listen to their bodies better and recognise when they are 'actually' hungry rather than just eating because 'it's that time of day'. As someone who used to love the sweet snacks in between meals I can honestly say that I no longer crave those snacks. If I do get peckish I simply opt for a chunk of cheese or perhaps a slice of cold meat. Occasionally I may have some full fat greek yogurt with a few berries and I will confess to a little 85% dark chocolate most days. So let's ditch these 'fake', processed 'foods' and just eat real foods that taste great, are satisfying and keep us looking and feeling great. Simple. No fads, no gimmicks just honest food. So this time four years ago we had a bit of a party weekend as Simon and I celebrated our 25th wedding anniversary. And as is customary with any party there was plenty of food and drink. But on the Monday morning I started something that would change everything I thought I knew about food and diet. Through a chance conversation with my daughter's karate instructors I took up a challenge they had developed called '90 Day Get Real Fat Loss'. The idea being that try something for 90 days, make a difference to how you look and what you weigh and then keep that change going for life. Well four years on I am living proof that you can make a change to decades of being told to eat a certain way, that the weight and inches can be lost, that the loss can be maintained and that this new way of eating is easily sustainable. For years, like I think most people, I'd not been happy with those numbers on the scale or what I saw looking back at me in the mirror. Now I know I wasn't obese, and I probably wasn't even classified as being overweight. Friends would tell me I looked fine, that I had nothing to worry about. But for me it obviously was something I worried about. My mum was diabetic and so I kind of knew that she had to avoid sweet stuff but that didn't stop us having sweet stuff in the house. Before Simon and I got married and had a place of our own we would pretty much eat whatever we wanted. I knew that too many cakes, biscuits and chocolate bars weren't good for you but I was active...we would be out three nights a week at clubs dancing for hours and then we started going to the gym three, maybe even, four times a week so we were burning off that bad stuff - right? About a year before we got married Simon's mum was diagnosed with high cholesterol and so Simon got tested in case it was hereditary and lo and behold he too had high levels. In the late 1980's this was all new to us; what did it all mean? The advice given by the doctor was to cut back on our fat and dairy intake as otherwise we were heading for heart problems and an increased risk of dying from a heart attack! With warnings like that we did as we were told. Out went the butter, the full fat milk, no more eggs and forget about cheese and fatty meats literally overnight! So for the next 25 years or so we followed, what we were all being told to follow, a low fat diet; after all this would work for those pesky high cholesterol levels as well as my mum's diabetes. We ate pasta, rice, stuck to chicken and fish, had cereals and toast for breakfast and sandwiches for lunch. We had low fat or fat free salad dressings and yogurts...in fact anything that had low fat, or fat free, on the label we probably had it in the cupboard and fridge. After all picking up a chocolate bar or dessert or biscuit with low fat blazoned across the packaging meant we could indulge with a clear conscience. Oh how wrong we were! So four years ago I decided to try something different. One thing I'd never done was to follow any mass marketed slimming regime...the skeptic in me always thought these were a bit of a scam and besides I really didn't fancy parting with hard earned cash to stand on a scale in a room full of people and be told whether I'd put on or lost a pound! But this 'Get Real Fat Loss' was different; it was developed by a karate instructor (Jason) who had an understanding of nutrition and was fed up of hearing the mums of the kids he was teaching moaning about weight loss and hearing the horror stories of their weight loss regimes. I saw photos of women I knew and the difference that this programme had made to their bodies. These weren't touched up, magazine, promotional photos these were genuine photos viewed on someone's phone. I think it was seeing these real life results that made me think 'what have I got to lose?'. The great thing was that under the guidance of Jason I had to figure out what would work best for me. After recording my food for a week Jason was able to analyse what I was eating and then come up with the best ratio of fat, protein and carbohydrate that I should be consuming. Now I have spoke about this before on previous posts but suffice to say the big change I had to make was to reduce my carb intake and up my fat! I estimate that my daily carb intake back then was around the 230g mark and this had to reduce down to about 70g per day; that was a big change! But I was all set to give this a go; I looked at what I had been eating to see where the changes had to be made - bread, pasta, rice, potatoes....OK so my first reaction was what can I have instead of these? Initially I would have a very small new potato with my salad and meat of choice or perhaps I would have literally 3 or 4 chips (fries) with my meal. When it came to rice I discovered very early on that cauliflower rice was a good substitute. But you know what? After a short while I realised that I didn't actually miss these foods and the more I thought about it the more I came to the conclusion that these were actually quite bland and were just 'fillers' on my plate. About 60 days in I reached my 'goal' weight and by the end of the 90 days I'd lost another 7 pounds. It was the first time in my life that attempting any kind of 'diet' had produced the dramatic results that you dream of. But more importantly I was enjoying my food, enjoying the results I'd achieved and knew that I couldn't go back to my old ways. But what about exercise I hear you say - well yes when I first started the challenge I would complete a series of body weight exercises at home, twice a day. So simple stuff like squats, lunges, press-ups and a few planks. But these did not get rid of the pounds these simply helped shape and tone what I'd got! For about the past year and a bit I've swapped daily exercise at home for visiting the gym a few times a week. This has proved to be great fun as we get to go as a family and lift heavy weights! I know that since going to the gym I have put on a few pounds but I also know that my muscle mass has increased while my measurements have remained pretty constant. It was only after I'd reached the end of the 90 day challenge that I came across a book by Gary Taubes called 'Why we get fat and what to do about it'. I remember reading it and everything just fell into place; this book echoed everything that I had done. It gave me the science behind what I had done...I was living proof of what adopting a low carb, high fat lifestyle was all about. So here we are four years on and we are still a low carb family (Oh yes all for one and one for all in this house!). I wouldn't change the way I eat now for anything. We eat well, we eat till we are full and we enjoy what we eat. I have a fridge full of butter, cream cheese, eggs (lots of eggs), double cream, full fat milk, greek yogurt and cheese. We eat red meat as well as chicken and fish. We have bacon for breakfast every morning! I have red wine most evenings and always a little dark chocolate - 85% is my favourite at the moment. What's not to love about all of that?! At the start of my 90 day challenge I weighed 147lbs and by the end I weighed 126lbs, a loss of 21 pounds. I did lose more weight after the 90 days dropping a total of 28 pounds. Since then I think my body has found a more natural weight around 128 - 130lbs which I am quite happy with and have maintained this now for almost 2 years. I have lost, and maintained, 2.5 inches from my waist, 3 inches from my hips and 2.75 inches from my bust. Here come the photos - eek! These were all taken on a mobile phone and have not been altered in anyway! So that's me...now and then...as I've said before if I can do it, anyone can. Low carb all the way! 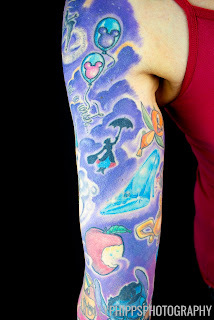 Well, after a longer than expected absence from the keyboard, I am back and I can finally reveal my full Disney sleeve. 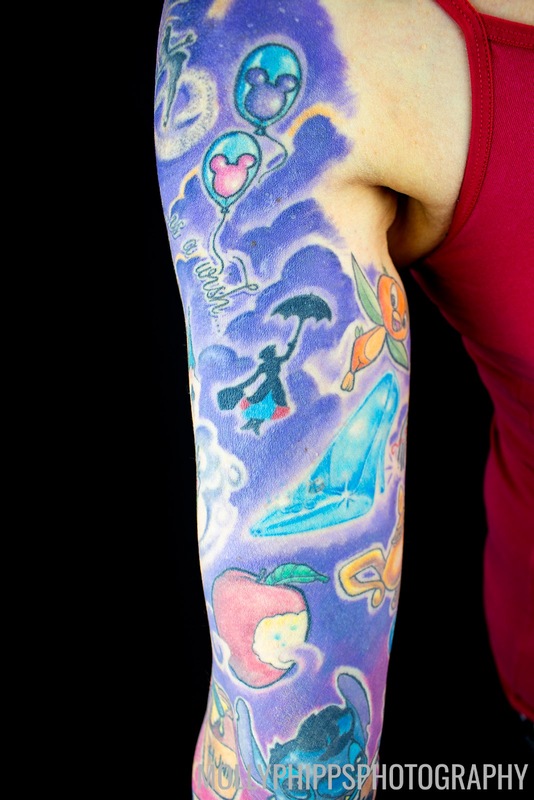 Yes my adventure into tattooing that started with a lower back piece a fair few years ago has now resulted in an armful of Disney! 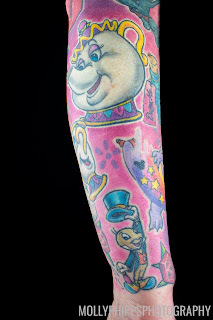 A big thank you has to go out to Rachael Huntington for starting the sleeve back in February 2016 and then to the amazing Simon Saint Heywood for taking it to its completion in August this year - an 18 month creation. 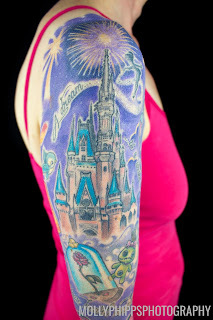 So the final couple of sittings saw a lot more background shading being added, some re-emphasised line work, plus fireworks over the top of the castle as well as some ink to probably a couple of the most painful areas I've yet experienced! On the same day I had a rose tattooed on my elbow and then a 'dinglehopper' and an 'orange bird' to my upper, inner arm (so just down from my armpit). 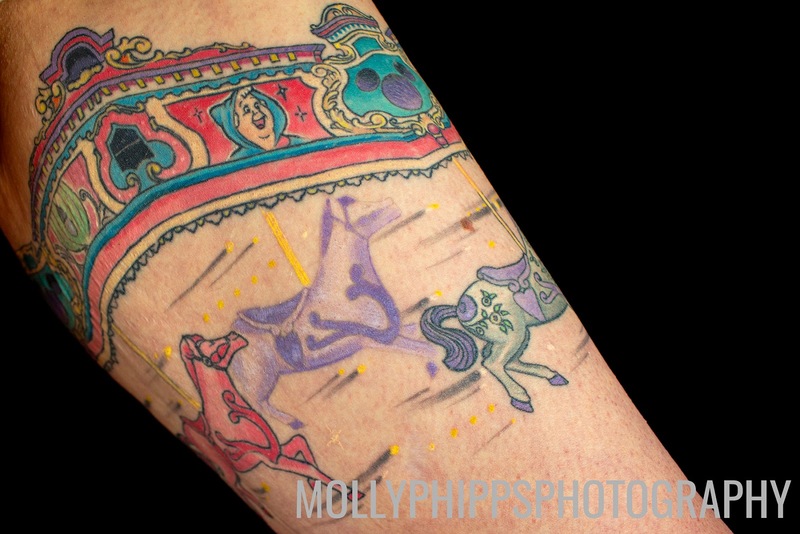 I have to say that the minimal pain from tattooing does not bother me at all but I will acknowledge that these two areas in particular are a little 'special'!! So what about some photos then?! Well thanks to my daughter Molly I finally managed to get some taken...although please excuse how cold I look in them! 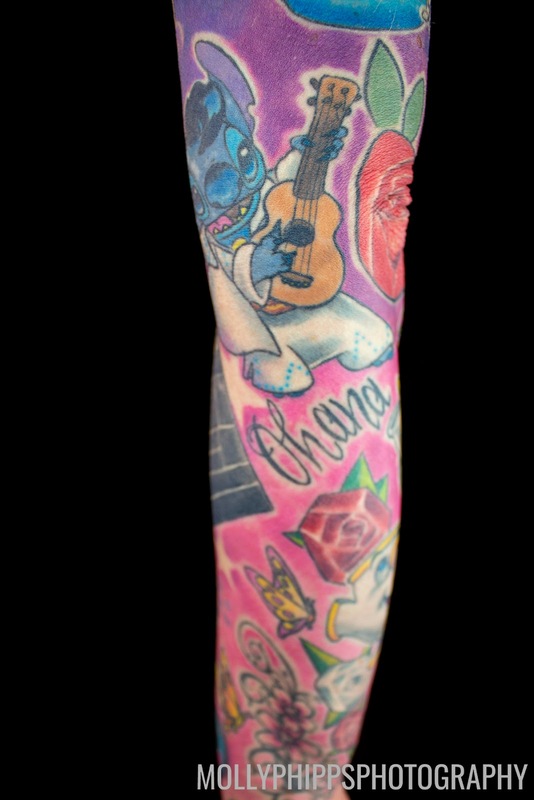 Hopefully with all these different angles (and my previous posts) I've managed to capture all the sleeve! I am truly in love with everything about this sleeve and it only inspires me to get more ink done! 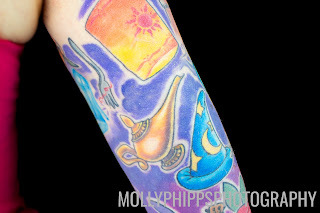 And talking of more ink I did manage a brand new piece, this time on my other arm and although still technically Disney this one is actually Star Wars themed. When Simon and I attended Star Wars Celebration London in July of 2016 as part of the Mandalorian Mercs Costuming Club (see these previous posts Wow What a Weekend Day 1, Wow What a Weekend Day 2 and Wow What a Weekend Final Day) we had the great fortune to meet the creator of Star Wars Rebels, Dave Filoni. He was so nice to chat with and we had a fantastic time meeting him. When he came over to us to say goodbye he put his hand on my shoulder and I had what can only be described as a complete fan-girl moment. So much so that afterwards I said that I ought to get a Star Wars tattoo where he touched me!! So almost a year later guess what? Yep I got my first Star Wars tattoo right where Dave Filoni touched me! 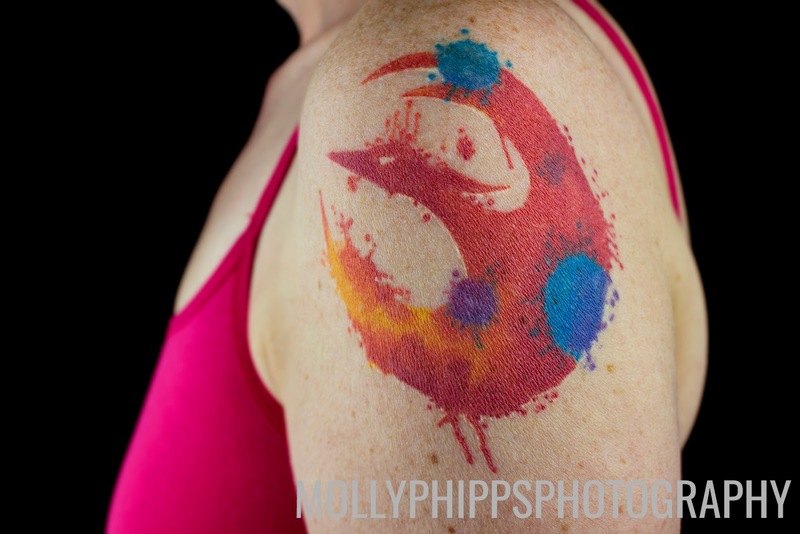 So on my left shoulder I have a Star Wars Rebels inspired tattoo; this represents the firebird that the character Sabine Wren (who is a Mandalorian) has on her armour...I know...I am such a geek! 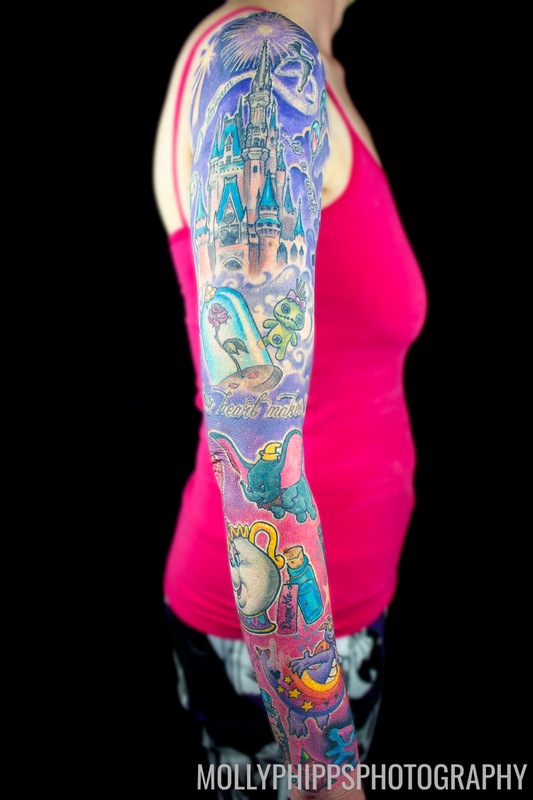 But you have to admit the tattoo is pretty spectacular! Co-presenter of the Disney Dream Girls Podcast. A married mum of two working in pre-school education in the UK. I have a love, obsession, for all things Disney and especially Walt Disney World which prompted me to write this blog in the first place - a chance for me to ramble on about my life with a heavy dose of Disney! Template images © Simon Phipps. Picture Window theme. Powered by Blogger.